I made my way to Target just before the 8AM opening to be one of the first to shop. A handful of shoppers (men and women) in various age groups were excitedly waiting to shop with me. Everyone was polite, enthusiastic, and friendly. No hoarding or frenzy here! 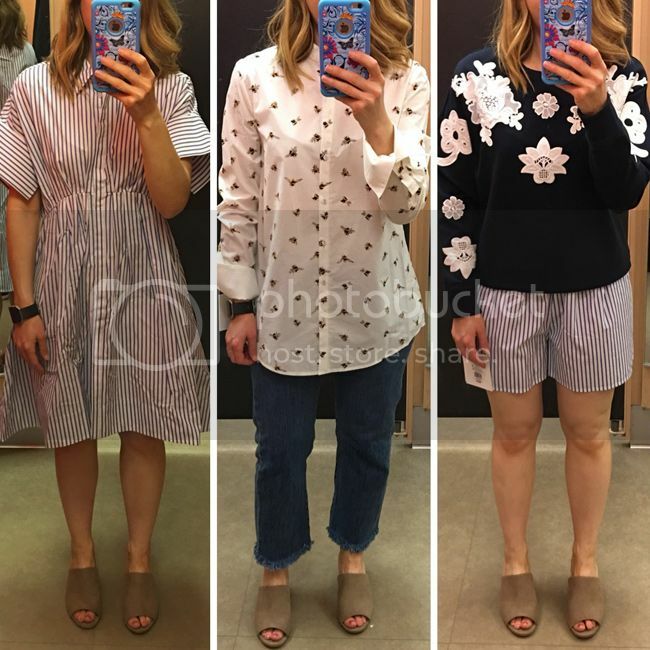 What follows is my shopping review with fitting room photos. Here's a look at the merchandise before we swarmed like busy bees. 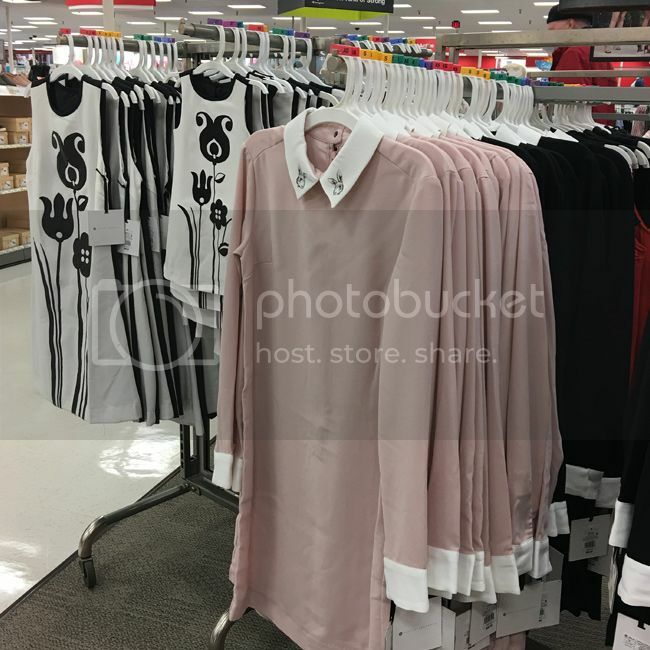 All of it was merchandised together in the Junior's department, making it easy to shop the various size ranges. 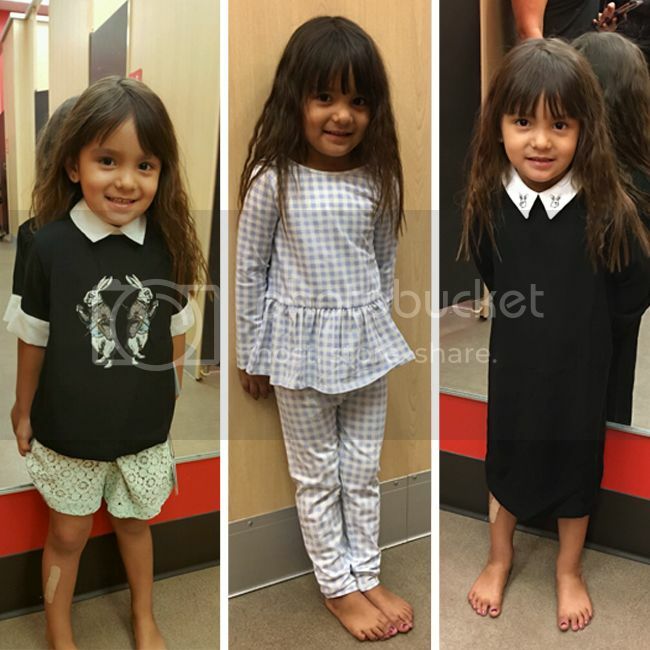 I did not spot anyone hoarding, and many shoppers headed straight to the fitting rooms. 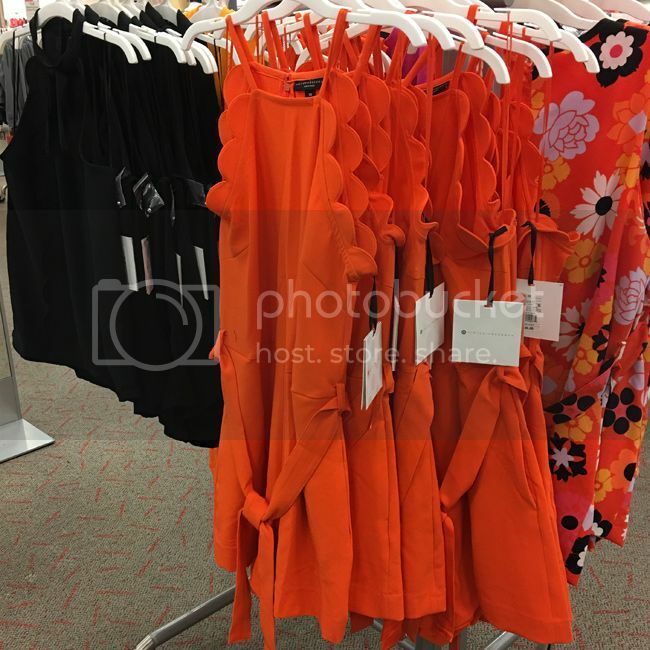 I noticed women in a wide variety of ages and sizes trying on the trousers and dresses, which was refreshing. 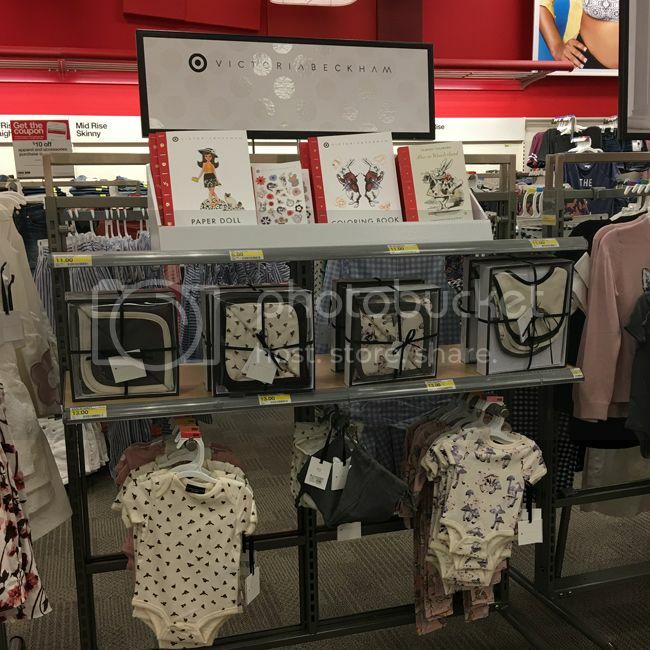 The infant, toddler, and Girls' merchandise wasn't in high demand in my store. A few helpful boyfriends and husbands chatted while we shopped. I can appreciate their dedication! 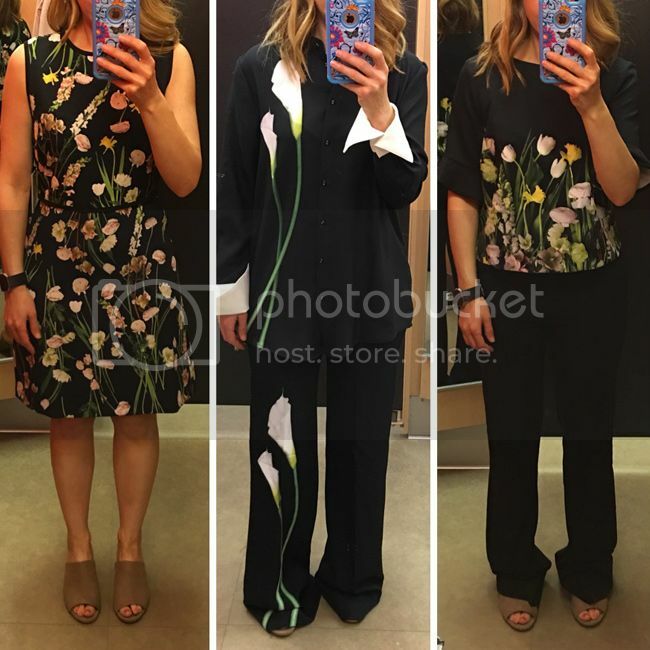 The Women's white gathered waist poplin top in the collection (seen in the photo below in the middle) is similar to this Victoria, Victoria Beckham poplin blouse for $325. 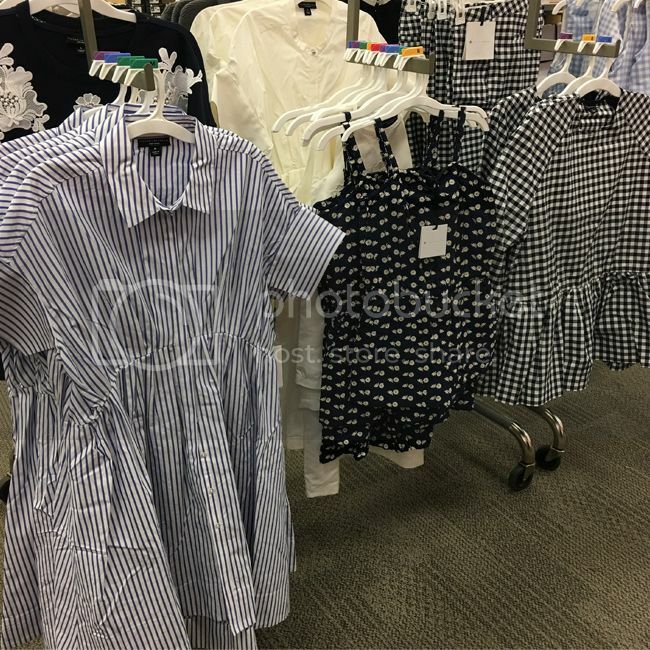 The blue striped dress is similar to this striped cotton dress by Victoria, Victoria Beckham for $560. 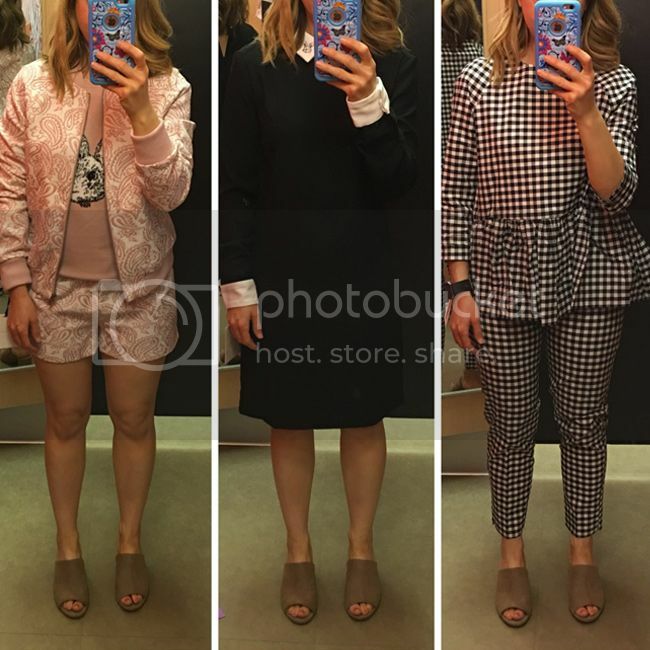 For reference, I wear XS or S and 2-4 at Target. 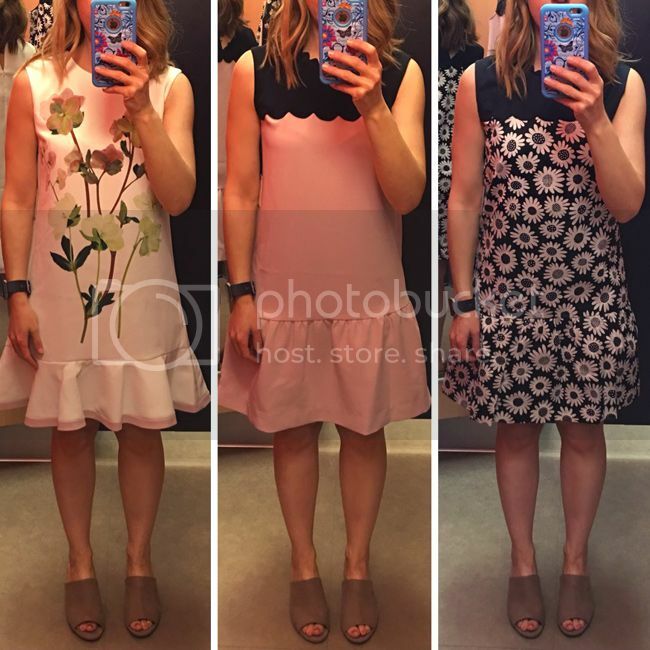 I'm petite, so I tried on some Girls' #VBxTarget dresses in XL out of curiosity. 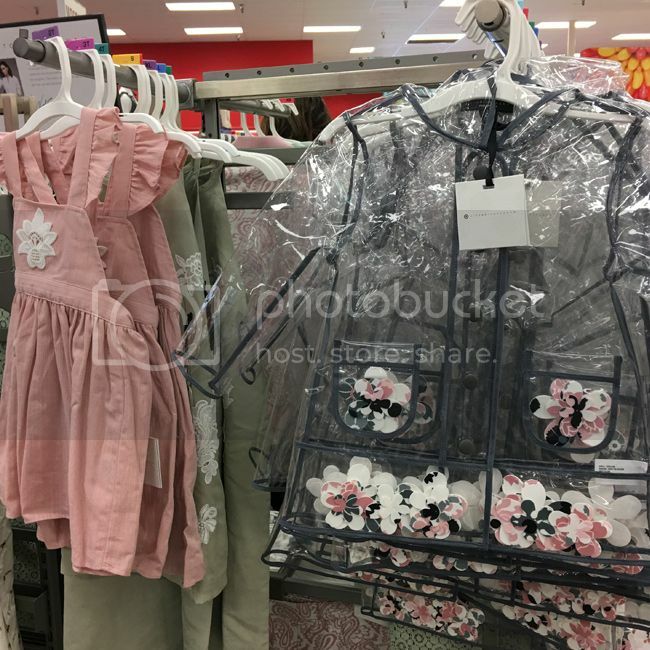 Pressed floral ruffle hem dress in Girls' XL. It's fully lined, stretchy, and comfortable. The fabric is sturdy and the back zip was easy to use. Surprise hit for me, since drop-waist silhouettes usually don't appeal to me. Blush scallop trim dress in Girls' XL. I didn't love the wrinkled fabric. The buttons at back of the neck were tricky for me. Cute for kids, but not for me. Daisy scallop trim dress in Girls' XL. Nice woven fabric, but back buttons tricky again. Runs slightly smaller than the other two dresses. Cute, for kids, but not for me. English floral satin dress in small. I though it was well tailored, flattering, and slightly stretchy. The zip can be tricky as it goes over the waist seam. I ordered it online and I am really excited to wear it soon. It's a top pick for me. I think it's flattering for many body types. Satin calla lily blouse in small with calla lily trousers in 2. Both are well tailored, true to size, made of sturdy fabric, and felt very comfortable. Note the French cuffs! The trousers have a tiny bit of stretch and are fitted through the hip. They flare out at the knee and ankle, are high waisted, and elongate the legs. I'll have to hem them for a better fit. Pajama vibes? VB wore this look, so no wonder the pants are sold out online. Blush jacquard bomber jacket in small. This is a top pick for me. It's partially lined, has pockets, and is true to size. It looks double the price of $35. Blush bunny sweater in Girls' XL. Great soft texture, cute shoulder button detail, and easy fit. Blush jacquard shorts in 2. They ran small for me, are well tailored, and comfortable. If you're curvy or unsure on these, size up. Black collared dress in small. It's tailored to be close to the body, is lined, and felt really easy to wear. Cute bunny detail! The back zip can be tricky on this one. Gingham peplum top in XS with gingham pants in 2. The top runs really big and has a tricky diagonal back zip at the shoulder seam, while the pants are fitted, comfy, and more true to size. Gathered waist stripe poplin dress in small. It runs big with an easy fit and non-stretchy waist. The curved seam is forgiving to the waistline but evokes maternity apparel vibes. The jury is still out on this piece. It definitely looks better without wrinkles, and I think the sculptured sleeves give it an elevated, almost designer-y look. The bee print blouse in small has an easy, non-tailored fit and lightweight fabric. The French cuffs elevate the top and make it feel special. I would've preferred a pointed collar over the banded one, but it's still a favorite. 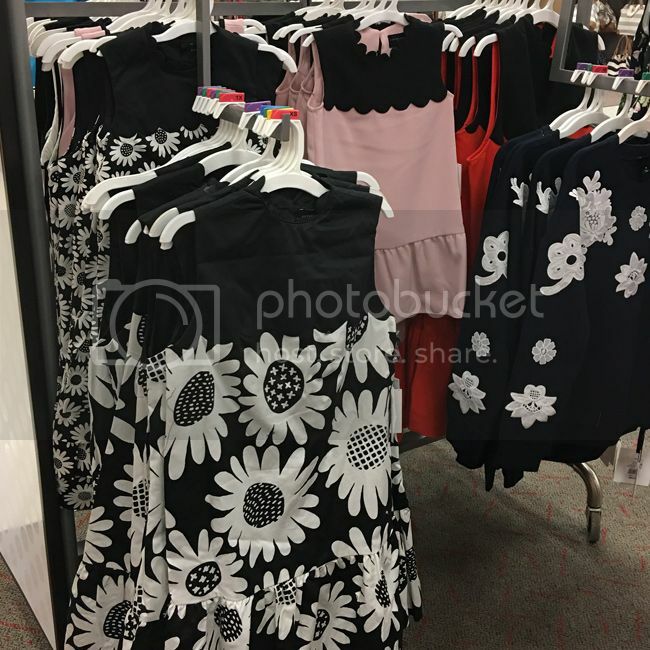 The bee print is hard to resist. The floral lace appliqué sweatshirt had great texture and details, was thick, and felt well made. I'm wearing it with the Girl's stripe poplin shorts in XL, which are lightweight, have an elastic waistband and sadly, no pockets. 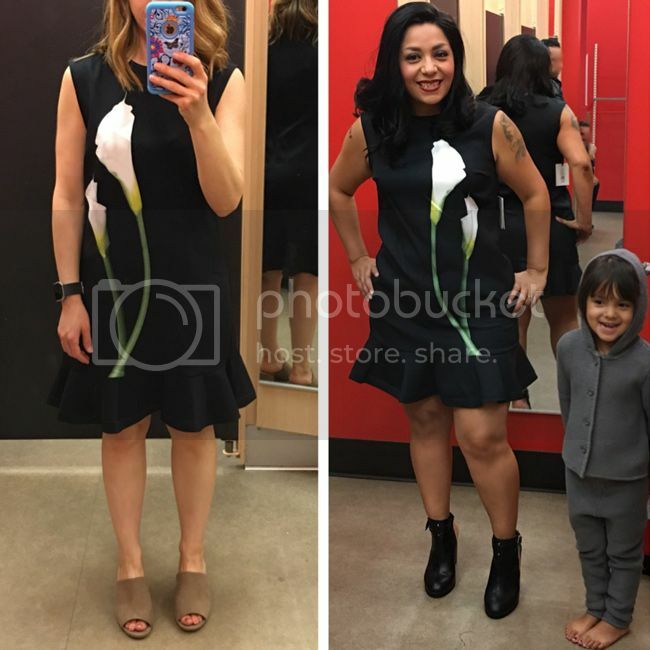 Below, the satin calla lily dress on me in small and medium on my friend. It's similar in silhouette to this Victoria, Victoria Beckham ruffle dress which has a price tag of $825. The back zip was easy to use, and the fit is well tailored. 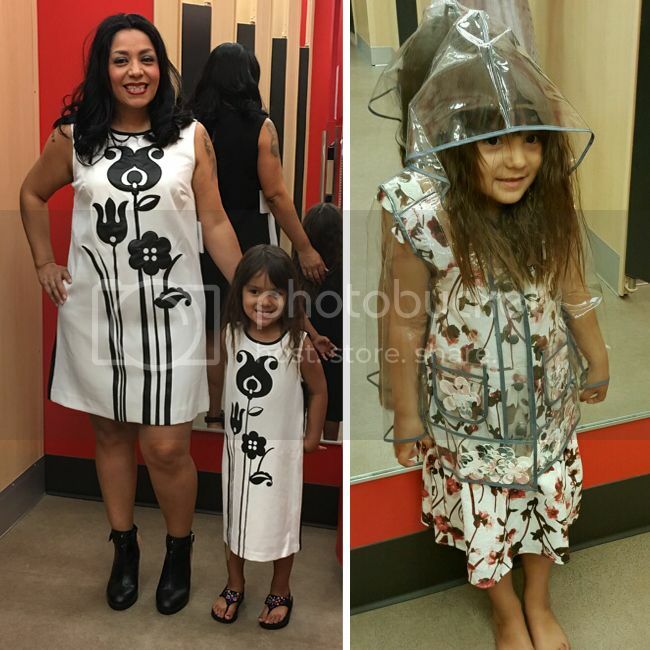 There's slight stretch and the print makes it elongating. My friend took this one home and I might go back for it! It's a chic piece for spring for only $35. 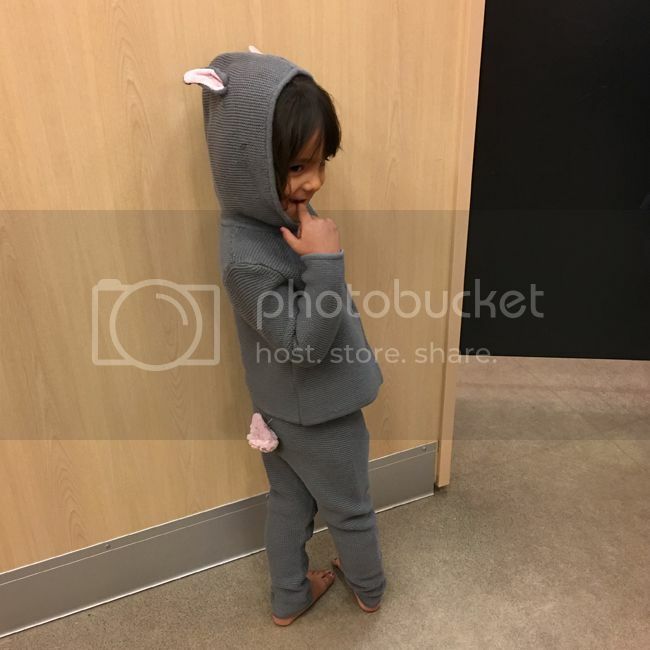 Her daughter rocks the grey bunny set in 5T and loved it so much. See those smiles? 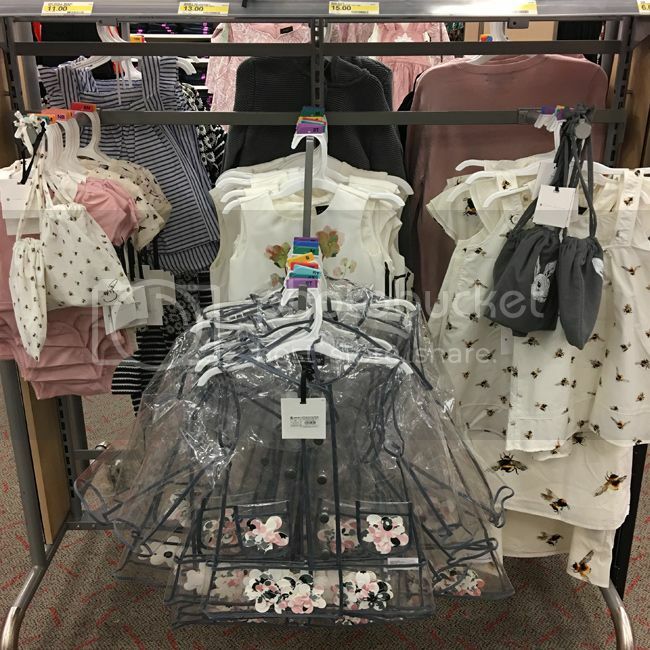 Above, the mommy-and-me tulip dress look (true to size) with the clear raincoat (a hit at my store). Below, another look at the grey bunny set ($38) which my model happily took home. 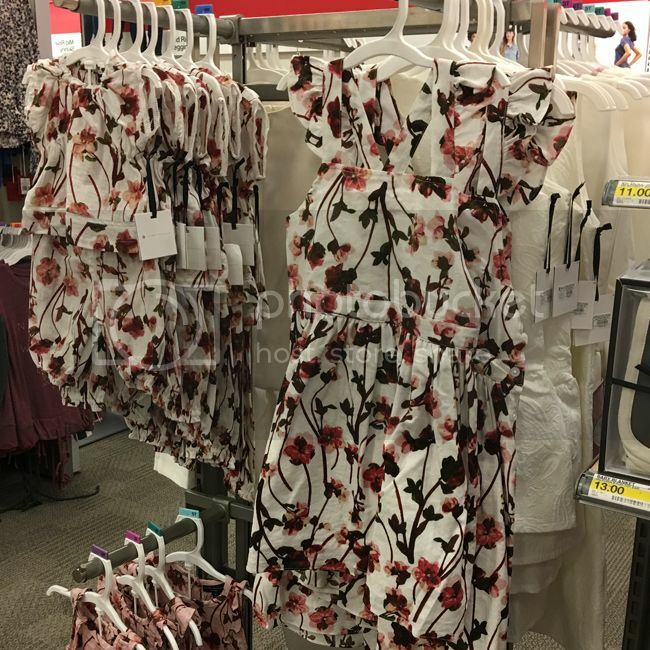 In terms of quality, tailoring, and construction, Target hit a home run on this collaboration. The twill pants were so Victoria, as were the drop waist dresses and bunny print details. I'll tell you what I want, what I really, really want...I would've liked to have seen sunglasses, bags, swimwear, and footwear, but you can't have it all, right? If you are in need of specific items, reach out via social or e-mail for my personal shopping service. For the buzz on all things #VBxTarget, see my Insta stories or catch up with me on Twitter & Facebook @thekeytochic for more photos.